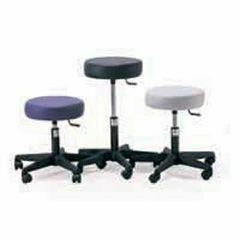 Sit down and put all of your energy into your treatments with our adjustable-height swivel stool. Press the lever to adjust the height within the 18" to 24" range of this durable, high-density padded stool that holds up to 300 lbs. The stable, five-point base is virtually tip-free. 14" round swivel seat and 3" high density multi-layer padding.